A small, island economy with a limited natural resource base, Cuba has traditionally depended on flows of goods, services and capital from abroad to increase its national wealth.2 The high degree of openness of the Cuban economy, and hence the disproportionate importance of the external sector, can be illustrated with a few statistics. In the 1940s and 1950s, for example, the ratio of the value of goods exports to total goods and services produced by the economy (as measured by the gross national product, GNP) averaged about 31 percent, while that of imports to GNP was nearly 26 percent, for a ratio of foreign trade turnover (the sum of exports and imports) to GNP of 57 percent.3 Moreover, prerevolutionary Cuba had few barriers to incoming foreign investment, and foreign capital was actively sought in many sectors. Foreign capital played a key role in financing the expansion of the sugar industry and national electrical power system, the establishment of telephone service, the construction of railroads, the provision of banking and insurance services, the construction and operation of oil refineries, and the development of the commercial mining industry. Forty years of socialism have not appreciably changed either the basic openness of the Cuban economy or its reliance on resource flows from abroad to finance development. In 1990, the last year before the serious economic crisis that has enveloped Cuba during the 1990s, merchandise exports accounted for about 28 percent of Cuban gross domestic product (GDP), while imports accounted for about 38 percent, for a ratio of trade turnover to GDP of nearly 66 percent.4 Foreign assistance— credits, grants, nonrepayable price subsidies—from the former Soviet Union and the socialist countries of Eastern Europe was instrumental in financing economic and social development in the island throughout the 1960s, 1970s and 1980s. The balance of payments (BOP) is “a record of a country’s money receipts from and payments to abroad, the difference between receipts and payments being the surplus or deficit.”6 BOP statistics depict the relationship between the amount of money a nation spends abroad and the income it receives from other nations in a given time period, typically one year. They consist of two accounts: (1) the current account, which tracks activity in exports and imports of goods and services, income earned from investments abroad, payments to foreign investors, and transactions for which there is no offsetting flow of goods or services (e.g., foreign aid, family remittances); and (2) the capital account, which tracks activity in capital flows, such as loans or foreign investment. BOP accounts are based on a double entry system, so that each debit is matched by a credit and therefore the balance of payments is technically always in balance. Nevertheless, the behavior of certain BOP items or subaccounts (e.g., the goods trade subaccount, the transfers subaccount, the long-term capital subaccount) can be very informative with regard to soundness of economic policies being pursued by a nation. Government monetary authorities such as ministries of finance or central banks generally prepare BOP statistics. In the case of Cuba, this responsibility has rested with the central bank. As will be shown in this paper, Cuba began to publish official BOP statistics in the late 1940s. Publication of official overall BOP statistics was discontinued in 1959 and did not resume until the mid-1990s. 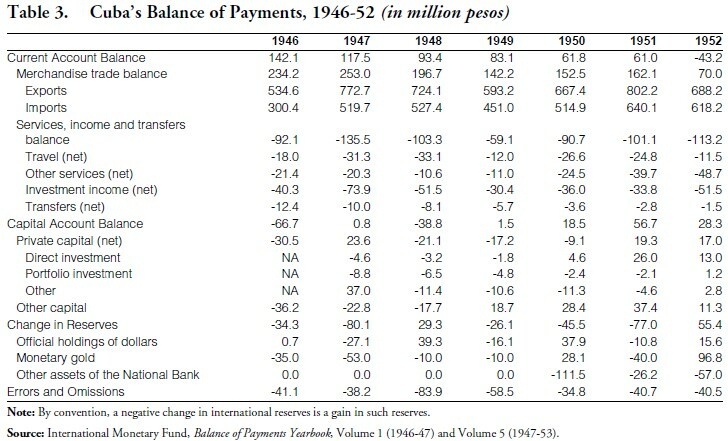 The upheavals in international payments after World War I, followed by the outbreak of the Great Depression in the world economy, which was triggered by a financial crisis in the United States in 1929, focused international attention on the importance for countries of compiling BOP statistics as a basis for formulating economic policies. The first comprehensive government effort to estimate the Cuban BOP — for 1946 — was conducted by the Dirección General de Estadística of the Ministry of Finance (Ministerio de Hacienda). It was published in 1947 in the form of a monograph together with an essay on the conceptual framework of BOP statistics and detailed notes on the sources and methods used to estimate each of the components of the Cuban BOP for 1946.14 Subsequently, BOP statistics for 1947-49 were also published by the same government agency.15 Table 1 reproduces the overall BOP statistics for 1946-49 from this source. In 1955, the Economic Research Department of the BNC launched a monthly Revista intended to provide current statistical information as well as results of research studies conducted by its staff. In December 1955, the Revista published the first of several articles analyzing the behavior of the Cuban BOP (for 1954) and describing problems and limitations of BOP statistics.17 BNC analysts laid blame for the time lag in compiling BOP statistics on delays in obtaining reliable foreign trade statistics — related both to merchandise and to services, such as international transportation (i.e., shipping). The BNC recognized that the BOP estimates were a work in progress, pointing to the relatively large “errors and omissions” category, which reflected transactions not properly recorded by the national statistical system. Subsequent articles in the Revista analyzed the BOP for 1955 and 1956 and discussed refinements of estimates for certain components of the BOP.18 Table 2 presents official Cuban BOP statistics for the period 1950-58 as published by the BNC, while Table 3 presents similar statistics for the period 1946-52 compiled from publications of the International Monetary Fund. Revolutionary Cuba did not publish BOP statistics for 1959 or for the 1960s, 1970s and 1980s. 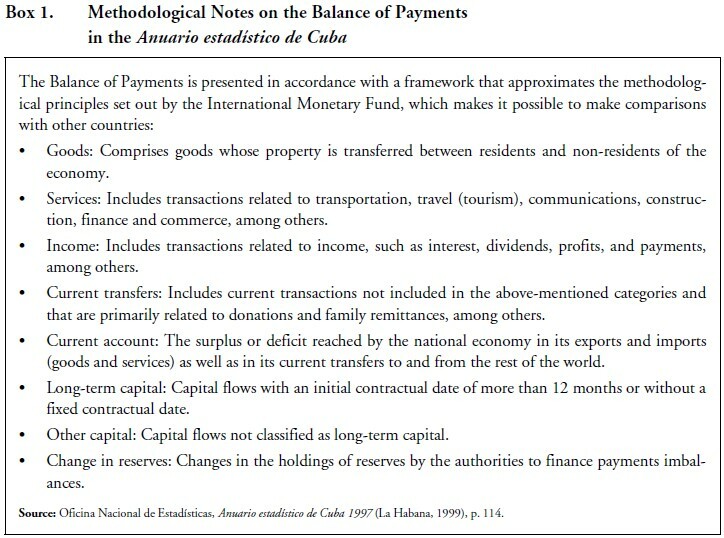 As is discussed below, during this period Cuba’s external economic relations were segmented: the first and quantitatively most important portion with the socialist countries, transacted in “soft” or nonconvertible currencies; and the second portion with Western countries, transacted in “hard” or convertible currencies. In the 1980s, Cuba did publish some BOP statistics, but only for the hard currency portion of its external accounts. In the 1990s, with the disappearance of the socialist bloc and of Cuba’s privileged trade and economic relations with the former socialist bloc, Cuban trade and external economic relations have been only (or at least primarily) transacted in convertible currencies. Official BOP statistics that have been published by the Cuban government for the 1990s therefore are based on transactions in hard currency and presumably reflect the universe of international transactions. In January 1959 the revolutionary government quickly began to change the nature and structure of the Cuban economy. What began as law-decrees authorizing the confiscation of property and funds controlled by the deposed dictator Batista and his collaborators turned into a much broader nationalization of private property and resulted in increased tensions with the United States over the compensation of affected U.S. citizens. In the second half of 1959 and 1960, using different pretexts, the Cuban government nationalized key industries, including those owned by foreign investors. In October 1960, Law 890 authorized the nationalization of remaining foreign investments owned by the U.S. citizens, those controlled by other foreign nationals, and key enterprises owned by Cuban citizens, virtually sealing the fate of private enterprise in Cuba. As trade and investment with the United States and other traditional trading partners dried up as a result of the nationalizations, Cuba established new economic ties with the Soviet Union and the socialist bloc countries. In mid-February 1960, Cuba and the Soviet Union entered into a trade and payments agreement as well as a credit agreement. The Soviet Union committed to purchase one million tons of Cuban sugar during each of the years 1960-64, with 80 percent of the value of sugar purchases to be paid with Soviet commodities (e.g., oil) and the remaining 20 percent with convertible currencies. The credit agreement granted Cuba line of credit of $100 million for the purchase of Soviet plant and equipment. The process of shifting trade and economic relations from the United States and the West to the Soviet Union and other socialist countries moved at a very fast pace. Prior to 1959 Cuba’s economic relations with the Soviet Union and the socialist bloc countries were negligible (limited to occasional purchases by these countries of Cuban sugar at world market prices). By 1961, however, Cuba’s exports to socialist bloc countries accounted for 73 percent of Cuba’s total exports and imports for 70 percent of total imports. For purposes of this paper, the significance of these changes is that through the 1960s, 1970s and 1980s, Cuba’s external economic relations were segmented. Trade and economic relations with the socialist bloc countries — which accounted for about 85 percent of merchandise trade turnover in the mid-1980s19 — were conducted through bilateral balancing agreements, tantamount to barter arrangements, in which individual transactions were made, and accounts settled, using either the currency of one of the two trading partners or “transferable rubles,” an artificial currency whose sole role was to serve as the unit of account in transactions among socialist countries. Because neither the currencies of the socialist countries nor the transferable ruble could be freely exchanged into “hard currencies” (U.S. dollars, Swiss francs, Japanese yen, deutsche marks) to purchase goods and services in international markets, these countries made efforts to balance trade bilaterally each year. Socialist countries routinely financed Cuba’s bilateral trade deficits by extending low-interest loans and also granted Cuba other financial assistance, including loans to finance development projects and foreign aid (grants). Meanwhile, trade and economic relations with developed market economies and with many developing countries were conducted following common commercial practices and using hard currencies. Western governments, financial institutions, or suppliers provided Cuba with credits to finance exports, particularly in the second half of the 1970s, when international lending surged in the aftermath of the 1973 oil embargo and credit was easily available as a result of the priority of financial institutions to loan “petrodollar” balances. These interest-bearing loans had to be repaid, in hard currency, according to a predetermined schedule. Because of currency incovertibility, Cuba could not apply surpluses in trade with the socialist countries to offset deficits with developed market economies or to service debt with these nations. To support the convertible debt rescheduling requests that commenced in 1982, the BNC began to publish annual reports of economic developments in the island, and later also quarterly reports.24 These reports contained, for the first time since the revolutionary take-over, official statistics on the portion of the balance of payments transacted in convertible currencies, mostly transactions with Western and some developing countries. These statistics are useful since no official BOP information was available for over two decades prior to their publication, but their value is very limited since they refer probably to less than one-fifth of Cuba’s overall international economic transactions during this period. Cuba’s hard currency BOP statistics for the period 1980-89 are reproduced in Table 4. The remarkable political and economic changes that occurred in Eastern Europe and in the former Soviet Union beginning in 1989 had a profound impact on Cuba and its economy. Within a matter of about 18 months, Cuba lost the preferential trade and economic relationship it had had for three decades with the former socialist countries. The Cuban economy experienced perhaps its deepest recession in the twentieth century, with GDP declining by more than 30 percent between 1989 and 1993. The disappearance of the Soviet Union and of the former socialist bloc has meant that Cuba’s foreign trade and economic relations since about 1990 have been conducted only hard currencies. Thus, Cuba’s hard currency BOP statistics presumably refer to the universe of international transactions. Moreover, Cuba’s National Statistical Office (Oficina Nacional de Estadísticas, ONE), has included BOP statistics from the BNC/BCC in recent publications, making them available to a wider audience.28 In its 1997 statistical compendium, Anuario estadístico de Cuba 1997, ONE has also provided brief methodological notes on the BOP statistics, stating that they are “presented in accordance with a framework that approximates the methodological principles set out by the International Monetary Fund, which makes it possible to make comparisons with other countries.”29 These notes are reproduced in Box 1. 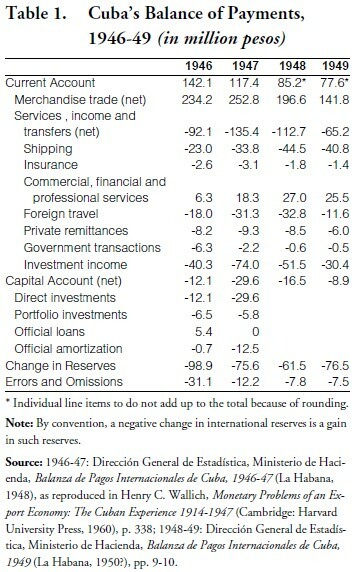 Cuba’s official overall BOP statistics for the period 1993-98 are reported in Table 5. Although the purpose of this paper has been to trace the historical development of Cuban official BOP statistics and present available data to stimulate research and analysis by specialists, some cursory comments on Cuba’s BOP statistics and situation in the 1990s are in order. First, despite the statement by Cuban statistical authorities that BOP statistics follow the methodology of the International Monetary Fund, it remains an open question whether this is in fact the case. The amount of data that the Cuban government has published is very scant, and therefore it is not possible to cross-check the data with other information to ascertain their reliability. Second, the data in Tables 4 and 5 support the proposition that Cuba’s external sector has shrunk significantly in the 1990s. Table 4, which refers only to the hard currency portion of the BOP — probably about 20 percent of total trade — shows goods 1989 exports and imports valued at 1384 and 1424 million pesos, respectively. By comparison, Table 5 shows that in 1993, Cuba’s total goods exports and imports were only 1337 and 1984 million pesos, respectively. Thus, Cuba’s overall goods trade in 1993 was roughly comparable to hard currency trade in 1989, suggesting that the trade volume of the 1980s was not feasible under commercial terms. And third, official statistics show that that revenue from services (primarily tourism and services rendered by Cuban workers laboring abroad) and remittances are the key sources of external resources for the Cuban economy. In 1998, the services account showed a surplus of 2182.6 million pesos, compared to 820 million pesos for net remittances. However, since it is estimated that tourism’s net contribution to hard currency income is only about 30 percent, remittances may be the largest single contributor of external resources to the Cuban economy in the second half of the 1990s. 1. This paper expresses only the views of the author. I am grateful to Joaquín Pujol for his detailed comments on an earlier version of the paper and for his assistance in obtaining balance of payments statistics from the International Monetary Fund. 2. The paper draws on earlier work by the author. See, e.g., Jorge F. Pérez-López, “Cuba’s Foreign Economic Relationships,” in Cuba: The International Dimension, Georges Fauriol and Eva Loser, editors, pp. 311-352 (New Brunswick: Transaction Publishers, 1990); “The Cuban Economic Crisis of the 1990s and the External Sector,” Cuba in Transition—Volume 8, pp. 386-413 (Washington: Association for the Study of the Cuban Economy, 1998); “El sector externo de la economía,” in 40 años de revolución: El legado de Castro, Efrén Córdova, editor, pp. 91-118 (Miami: Ediciones Universal, 1999); and “The Cuban External Sector in the 1990s,” in The United States and Latin America: The New Agenda, Victor Bulmer-Thomas and James Dunkerley, editors, pp. 267-285 (London: Institute of Latin American Studies, University of London, 1999). 3. The data, which refer to the period 1945-58, are from Carmelo Mesa-Lago, The Economy of Socialist Cuba (Albuquerque: University of New Mexico Press, 1981), p. 79. 4. Calculated from data at current prices from Anuario Estadístico de Cuba 1997 (La Habana: Oficina Nacional de Estadísticas, 1999), p. 84. 5. “Cuba necesita más divisas en 1997, advierte ministro,” El Nuevo Herald (28 September 1996), p. 1B. 6. Poul Host-Madsen, Balance of Payments: Its Meaning and Uses, IMF Pamphlet Series No. 9 (Washington: International Monetary Fund, 1967), p. 1. See also Armando Linde, “The Balance of Payments: Concepts and Measurement,” in this volume. 7. Poul Host-Madsen, Macroeconomic Accounts: An Overview, IMF Pamphlet Series No. 29 (Washington: International Monetary Fund, 1979), p. 35. 8. Joaquín P. Pujol, “Membership Requirements in the IMF: Possible Implications for Cuba,” Cuba in Transition—Volume 1 (Miami: Florida International University for the Association for the Study of the Cuban Economy, 1991), p. 96. 9. Henry C. Wallich, Monetary Problems of an Export Economy: The Cuban Experience 1914-1947 (Cambridge: Harvard University Press, 1960). 10. Wallich, Monetary Problems of an Export Economy, pp. 326-327. 11. Wallich, Monetary Problems of an Export Economy, p. 327. 12. Wallich, Monetary Problems of an Export Economy, pp. 327-328. 13. Wallich, Monetary Problems of an Export Economy, Appendix B. 14. Dirección General de Estadística, Ministerio de Hacienda, Balanza de Pagos Internacionales de Cuba, 1946 (La Habana, 1947). 15. E.g., Dirección General de Estadística, Ministerio de Hacienda, Balanza de Pagos Internacionales de Cuba, 1949 (La Habana, 1950?). 16. E.g., Memoria 1950-51 (La Habana: Banco Nacional de Cuba, 1951) contained several tables of statistics on merchandise trade and a set of tables on the number of foreign tourists. The latest issue of the Memoria that was published appears to be for 1958. 17. “El Balance de Pagos Internacionales de Cuba,” Revista del Banco Nacional de Cuba 1:12 (December 1955), pp. 589-600. 18. “El Balance de Pagos Internacionales de Cuba en 1955,” Revista del Banco Nacional de Cuba 3:1 (January 1957), pp. 5-20; and “El Balance de Pagos Internacionales de Cuba en 1956,” Revista del Banco Nacional de Cuba 3:9 (September 1957), pp. 281-298. 19. In 1985, 86 percent of Cuba’s exports went to the Soviet Union and the six Eastern European socialist countries, and an additional 3 percent went to other socialist countries (e.g., China, Vietnam); meanwhile, 81 percent of Cuban imports that year originated from the Soviet Union and the Eastern European socialist countries and 2 percent from other socialist countries. See Jorge F. Pérez-López, “Swimming Against the Tide: Implications for Cuba of Soviet and Eastern European Reforms in Foreign Economic Relations,” Journal of Inter-American Studies and World Affairs 33:2 (Summer 1991), p.128. 20. Banco Nacional de Cuba, Economic Report (La Habana, August 1982). 21. Economic Report, August 1982, p. 44. 22. Economic Report, August 1982, p. 55. 23. On Cuba’s hard currency debt and its rescheduling, see Archibald R.M. Ritter, “Cuba’s convertible currency debt problem,” CEPAL Review, no. 36 (1988), pp. 117-140. 24. The annual reports, published in Spanish and English, were titled Informe Económico or Economic Report, and were issued generally in mid-year. The quarterly reports were titled Informe Económico Trimestral or Quarterly Economic Report. 25. Banco Nacional de Cuba, Economic Report 1994 (August 1995). 26. In May 1997, Cuba passed legislation establishing the Cuban Central Bank as an autonomous and independent entity and assigned to it traditional central banking functions. The BNC, which had performed central and commercial banking functions since 1960 when the commercial banks were taken over the state, remained in existence, but its role was relegated to commercial banking. 27. Banco Nacional de Cuba, Economic Report 1995 (May 1996); Banco Central de Cuba, Informe económico 1997 (May 1998); and Banco Central de Cuba, Informe económico 1998 (April 1999). 28. E.g., Oficina Nacional de Estadísticas, Anuario estadístico de Cuba 1997 (La Habana, 1999) and Oficina Nacional de Estadísticas, Cuba en cifras 1998 (La Habana, 1999). 29. Oficina Nacional de Estadísticas, Anuario estadístico de Cuba 1997 (La Habana, 1999), p. 114.